On the beach in the quiet Roads End Neighborhood. This Romantic Cape Code home has private stairs to the beach. 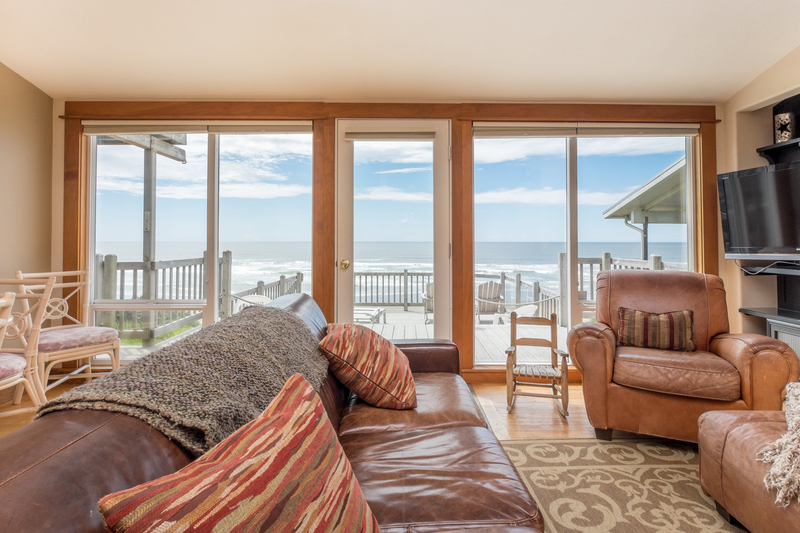 Large windows & decks for your enjoyment of surf & sand views or spectacular sunsets. Wifi. Cable includes ESPN! Your escape opens to slated entries with marble floors and light, open, airy rooms with vaulted ceilings that opens to a large deck leading to private beach stairs! Melt in the comfy furnishings while watching the big screen TV! 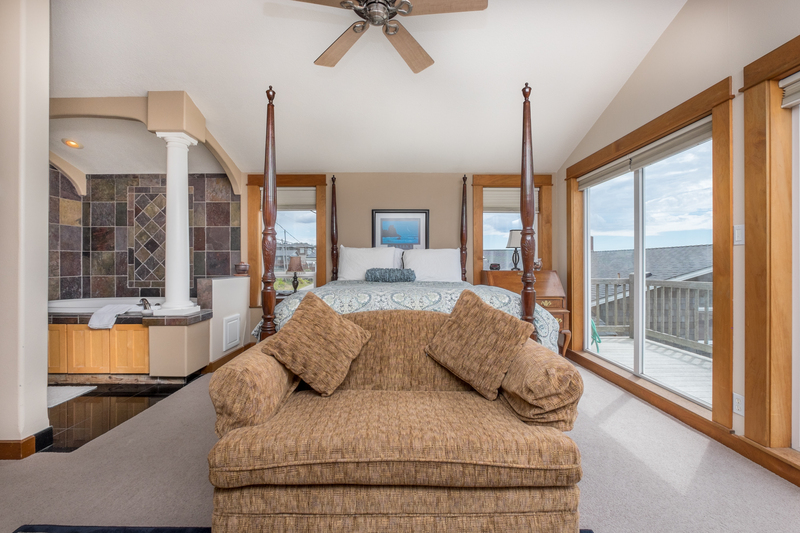 Large master bedroom with 4 post bed, JETTED TUB for 2, private deck and entertainment system! Cozy fireplace in Master bedroom. Truly a master bedroom! Also a 2nd roomy queen bedroom with full bath. *Max 4 person including stop-bys* and SLEEPS 4, 2 vehicles . Summer 2019 July & Aug. 5 night minimum (unless filling in a gap). Please avoid a Single Night gap May - Sept. & Spring Break. Memorial Day & Labor Day Weekends 3 nt. Minimum. No Am Exp Please. Do you need trip Insurance? "Always a great time at Moonbreaker! It’s perfect for two couples. We were provided with necessities. Comfortable furnishings both inside and on the deck. It would be nice to have a regular oven rather than just a microwave/convection oven however." "Amazing views and well decorated. Close to shopping and stores. " for our vacation reservations. " "This is my 4th stay at Moonbrealer. My husnband and I stayed there when we would come to the beach alone without our family. We always enjoyed the cozy nature of this beach house. My husband passed away two years ago and this time I came with family and we enjoyed the beach house once again. I had many good memories there and appreciate the amentities Comfotable beds and furniture. Great beach access and a wonderful surf light are just some of the good parts. I would return again. " 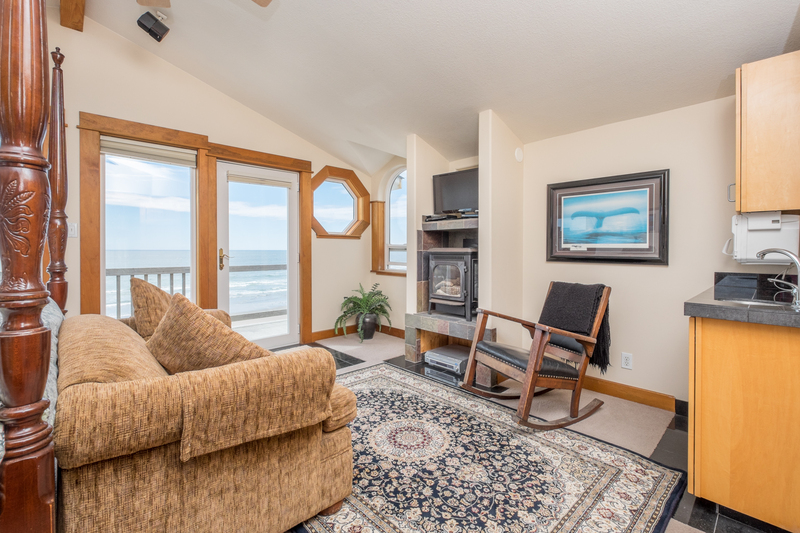 "Moon Breaker was the ideal home for my husband and I to relax and have a delightful winter break at the beach." 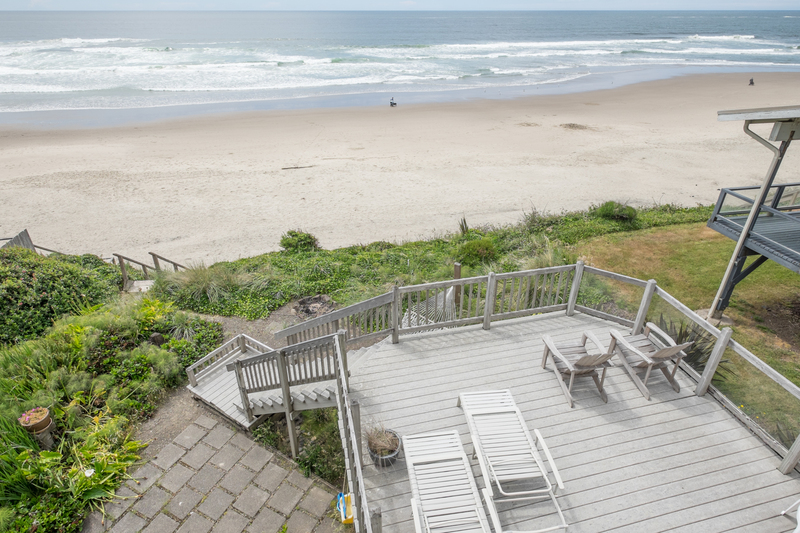 "The house is great on a beautiful beach"
Manager Response: Thanks for staying at Moonbreaker! Hope to see you again soon! "My husband and I had never spent any time in Oregon before. We were in for a wonderful surprise. Beautiful landscapes and tranquil beaches helped to make are vacation one of the best. 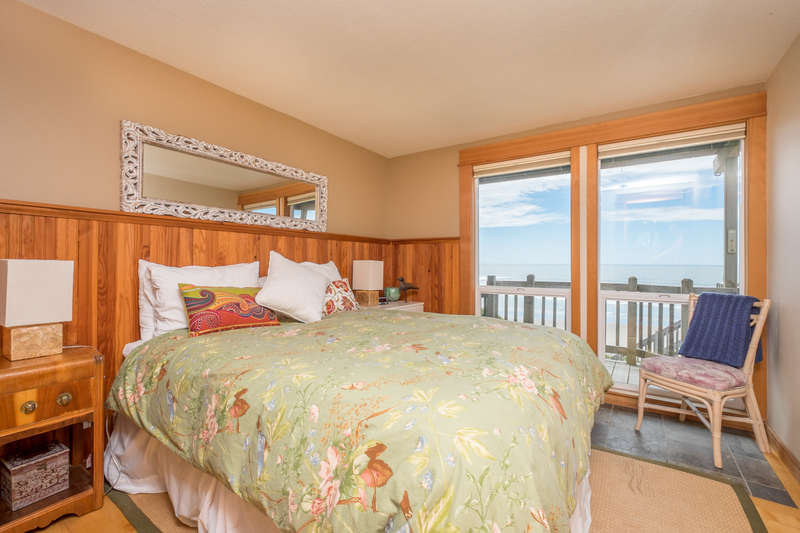 Moonbreaker was a cozy home with the most beautiful views of the ocean. Everything one would need was there. Looking forward to returning." Manager Response: So happy that you enjoyed Moonbreaker! Hope to see you again soon! "Wonderful place to stay and totally met our expectations. The views are amazing, the beds comfortable and the kitchen well equipped. We would definitely stay here again. " Manager Response: Happy that you had a great stay at Moonbreaker! Hope to see you again soon! "We loved the location of the home and the house was so well maintained. We appreciated that everything was in working order and that the kitchen was so well stocked. A beautiful home that allowed for a beautiful vacation." Manager Response: So pleased that you enjoyed Moonbreaker! Come visit again soon! "Superb accommodations and of course the view is what it is all about! " "We hoped for views and waves from storms and walks on the beach. We were not disappointed. We sat for hours watching the surf in the living area with the gas logs keeping us warm. Ours was a lovely stay on the Oregon coast!" "The house was well kept, stocked with materials, functional and clean.The location was quiet yet on the beach. One suggestion - The microwave convention oven should have an instruction book as with no oven per say it was difficult to use. One improvement - The only negative was the extremely erratic and slow wifi"
"Been coming here for years and as usual it was a great week. Love this place, just can't stay long enough. " Manager Response: Happy you enjoyed your stay at Moonbreaker! Visit again soon! "We were immediately assisted if needed, i.e., television issues; never hesitant about responding to our calls, very gracious and immediate response. I think the house could use some upgrades especially the couches in the living area and the floors. Overall, very conveniently located on the beach and the property is well cared for; clean. Would recommend to friends, great location and A1-Rentals is excellent. " Manager Response: Thanks so much for staying! Hope to see you again soon! "Locks on the doors were very hard to operate. Lock box very difficult to open. Poor lighting in the living room. Upstairs bed too high to jump into. But overall, nice decor, clean, nice kitchen with washing machine right there." "A cousin and her husband came out from St Louis. Her first time at the Pacific Ocean. Weather was showery the first day but the next 3 days were sunny, not much wind (didnt get to fly kite) but was warm. Sat on the deck in the sun and totally enjoyed watching the waves. The house met every expectation we had. This is a great house for two couple getaway No traditional oven but the microwave is also convection so a frozen lasagna fits easily. Definitely will be back to this house!" Manager Response: Glad you enjoyed Moonbreaker and the great weather. Come visit again soon! Wood floors need to be re-finished!! The house needs a little TLC"
"This place is the best ever hands down ....place was very clean and had everything you need. Going to rent again next year." Manager Response: Glad you enjoyed Moonbreaker! Come visit again soon! "The home was perfect with wonderful views of the ocean. It was very clean, well stocked, and comfortable. I would rent it again. " Manager Response: So glad you enjoyed Moonbreaker! Visit again soon! "Our vacation was wonderful. The weather and house was great. There are light bulbs that need to be replaced upstairs in the bathroom. The upstairs needs a mirror above the bar sink. Just to have another lighted area for getting ready. We have rented this house for over 15 years now. We would love to buy it!" "What a special place to disconnect and recharge! Loved the house and all of it's amenities. Every morning was like waking up on a postcard! Incredible walks down the beach and wonderful hiking near by. Will definitely return even thought it is 2,444 miles away! Wonderful Beach Retreat!!!" Manager Response: Glad you had a great stay at Moonbreaker! Please come again soon! "Had a wonderful time the house was great the view was great." Manager Response: So glad that you enjoyed Moonbreaker! Please come back soon! "The view couldn't have been better, the house was extremely comfortable and perfect for us, also so tastefully decorated. We definitely plan to be back!" Manager Response: Glad that you enjoyed Moonbreaker! Come visit again soon! 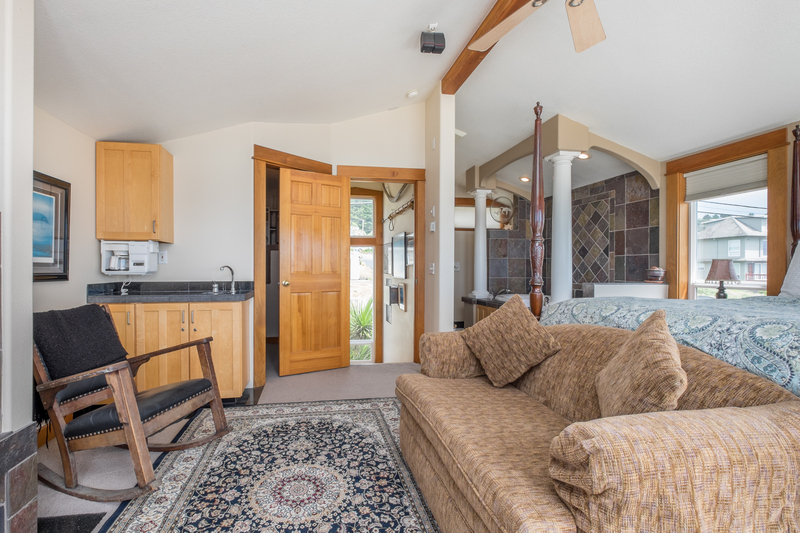 "We have been staying at Moonbreaker for over 10 years now and it is so comfortable and relaxing. A good stress-reliever, watching the waves, walking on the beach, reading a book and relaxing. Leave your troubles at home and come relax here." Manager Response: Pleased that you enjoyed the Moonbreaker again! See you again soon! "Great location. Unique little house, with magnificent beach access. We loved it." Manager Response: Glad that you loved Moonbreaker! Come back again soon! "Wonderful views. Great location.Quiet and comfortable. " Manager Response: So glad that you enjoyed Moonbreaker! Come again soon! "We have stayed at Moonbreaker several times through the years. It is truly a special place. The only complaint/disappointment is that there is a crack in the flooring of the downstairs shower. It was there last year when I was there. They have put a bath mat over it but it needs to be fixed. It won't stop me from continuing to book our yearly trip there though." "Excellent beach house in Roads End! We had an amazing time at this cozy house. 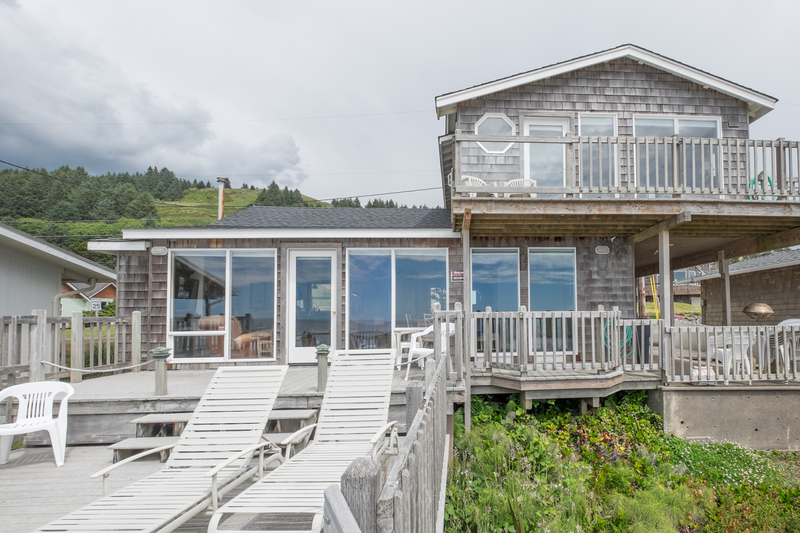 It exceeded our expectations- clean, gorgeous views from every room, awesome decks upstairs & down, private steps right onto the best beach in Lincoln City, fireplace and well equipped kitchen! The weather was perfect during our Nov stay and A1 Beach Rentals made us feel right at home! We can't wait to return to the Moonbreaker! Love Love Love it! " Manager Response: Thanks so much for your kind review! Please visit again soon! "As always we had a great time. We did miss the hammock, but other than that it was a the same great place as always. We have been coming back for years and hope to continue doing so. We have recommended this place to several people and it's getting harder to get it." 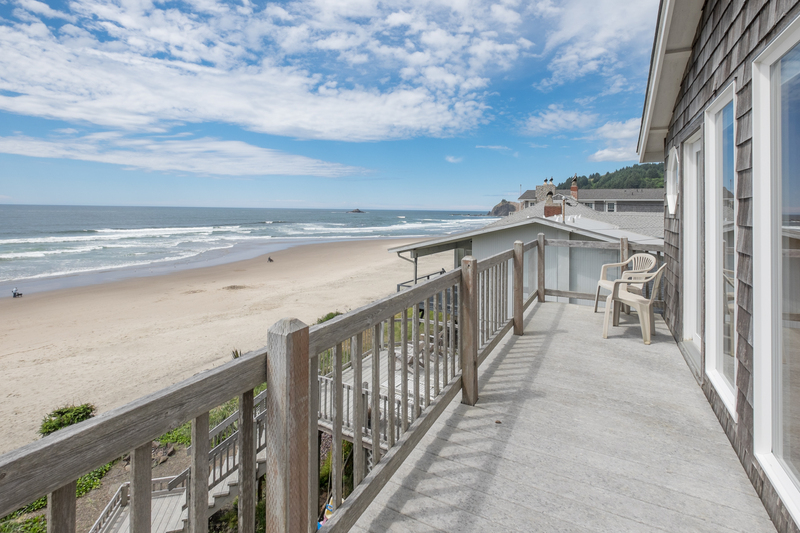 "We enjoyed the property and the Oregon coast very much. We even had nice weather." Manager Response: Glad you enjoyed your stay at Moonbreaker! Please come again soon! "I have been staying with A1 for almost 10 years now and we have yet to find a house we don't love! This year I traveled with a much smaller group, just two couples! The house was perfect for what we needed and you cannot beat the views and privacy on Logan Road! Amazing weather was the bonus for April! We WILL be back every year to come and A1 is my go to when looking for a home to rest my sandy toes! " Manager Response: Thanks for your kind review! So glad you enjoyed your time at the beach! Visit again soon! "We've always liked Moonbreaker, great location, quiet and a cozy home. " Manager Response: So glad you enjoyed your stay! Hope to see you again soon! Stairs to the beach need to be cleaned up." Manager Response: Thanks for coming! "This was an awesome place for the two of us, it's nice that it sits back from the houses on the other two sides, so it was secluded from some of the winds, but the view straight out is great. The beach is nice for walking. The outside firepit was a nice bonus. The old-time surf-light was awesome (something that I remember from the 1970's when we visited). It has a nice kitchen and the gas fireplace are actually nice to have no-stress to have to worry about damp firewood, so they were great. We will definitely stay here again." Manager Response: Really glad you enjoyed your time at the beach! Please come again soon! "Very unique and comfortable beach home.Fabulous views! We hope to come back every year. Thanks." Manager Response: Glad you enjoyed Moonbreaker! Please visit again soon! "It was a stormy weekend at the Coast. This was the perfect spot for a mother/daughter weekend! The house is so comfortable, and the view spectacular! Can't wait to go again and again!!!" "Fantastic! The home is absolutely charming, right on the beach, well stocked kitchen. it was like walking into joy." Manager Response: Really glad you enjoyed your stay at the beach! Visit again soon! 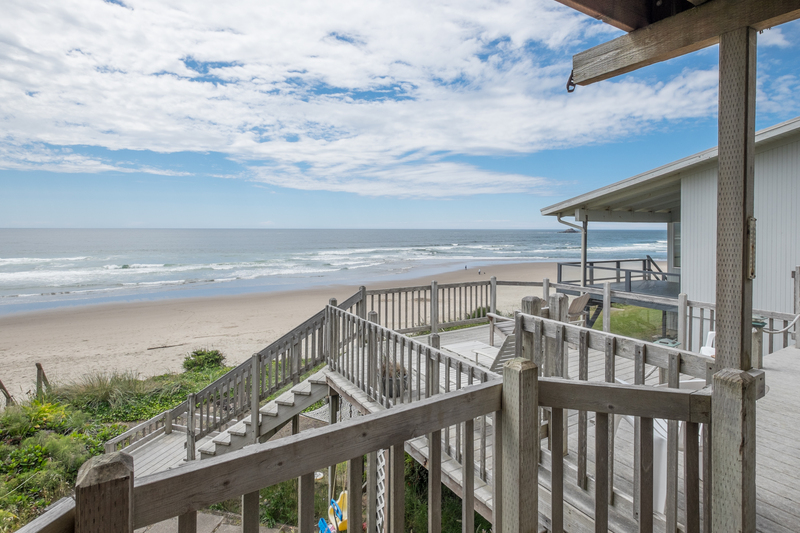 "We are long time vacationers in Lincoln City, and 2017 was our first time renting from A-1 Beach Rentals. They were fabulous from start to finish and the property was really great. Moonbreaker a great property and the perfect location. We love the Road's End area. Awesome beach, easy walk to the tide pools, close to Safeway and McMenamins (for tater tots and essentials like that). Although, Moonbreaker is a small property, it fit for me and the kids. I would be ideal for a couple too. Perfect deck/patio area and perfect location, nicely decorated, ample supplies, well stocked kitchen. It is small, so there is not much in the way of storage in the kitchen for food, and there is no oven. You have to bake in a convection style microwave combo thing, so that is a definite challenge,especially when trying to keep teenagers stocked with snacks and things. The only other challenge is there only being one small shower. The master has a lovely tub and a quasi shower, but it's not very practical. Everything else is absolute perfection. Great neighbors too! We really enjoyed it and can't wait to be back. I would highly recommend working with A-1 Beach Rental again. I also had the privilege of meeting the housekeeper for the property and she was lovely and very helpful." Manager Response: Thanks for your kind review! So glad you enjoyed your time at Moonbreaker! Please visit again soon! "We go over there to watch the Super Bowl, enjoy the ocean, and Lincoln City and to be with our friends." "We love this place. We stayed for our 25th anniversary and came back as a part of our 30th. It is a perfect combination of coziness and charm. The access to the beach and amazing views of the ocean add to the ambiance. We also love sitting on the deck and watch the world go by while sipping on beer or champagne. Highly recommended as a great retreat from the world. " Manager Response: Thanks for your kind review! Please come again soon! "Great time, fabulous view, very comfortable and cozy. Only thing we don't love is the oven. Pain in the neck to use. This was our second stay for a week and have reservations for next year." "it was fine. It may be about time to upgrade the Furniture. Nothing has changed in 6 years"
Manager Response: Thanks for staying at the Moonbreaker! Please come again! "This house is the perfect beach get-away. Cozy and comfortable with everything you need for a relaxing vacation! Very comfortable furnishings! Great location in Lincoln City - close to shops and restaurants but in a quiet neighborhood away from all the hubbub. We will definitely stay here again!" Manager Response: So glad you enjoyed your stay at the beach! Please come again! "The property and house were all that were described by advertisement. We were blessed by a sunny day and beautiful ocean views from the house or deck. Pos of seals gathered in the ocean for us to watch from the house. 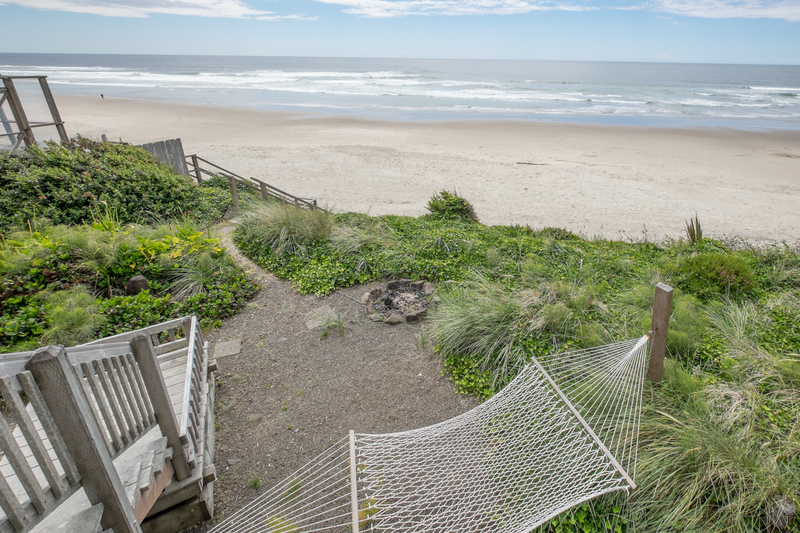 Easy access to the beach from back deck. The kitchen was well equipped which made eating in on our rainy day so relaxing. We would definitely recommend and choose this roomy cottage when we visit again. Very comfortable beds and heating. 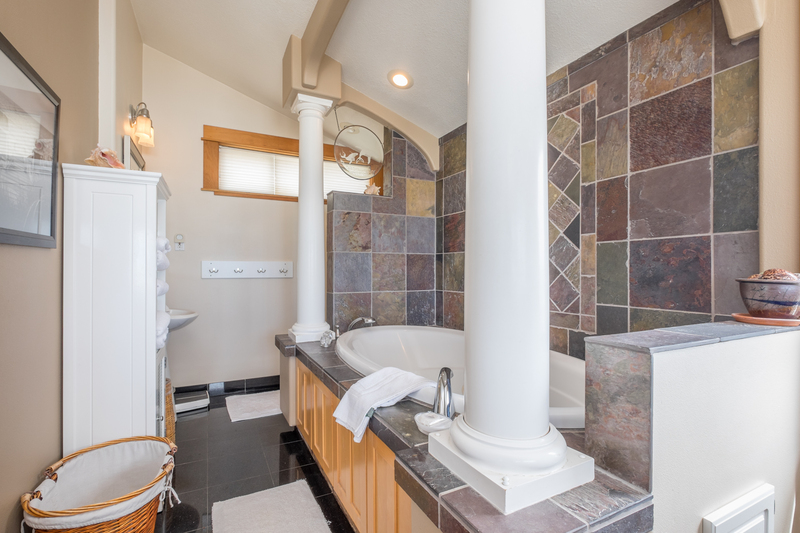 2 fireplaces and bathrooms. Both bedrooms had separate, lovely views." Manager Response: Thank you for your kind review! So glad you enjoyed your stay! Please visit again soon! "My daughter and I love to go to the beach during any season. We loved the property is right on the beach. The house was perfect for the two of us. The neighborhood is very quiet and one morning while we were out we ran into four beautiful deer out for a stroll and a snack in someone's yard. This is some place we will come back to! " Manager Response: So glad you enjoyed your stay at the beach! Please visit again soon! "This was our second time staying at Moonbreaker. We would recommend this house to any couple or small family. Plenty of room, lovely deck, loved the plants around the home. Saw deer every morning, one was right next to the deck. " Manager Response: So glad you enjoyed Moonbreaker! Please visit again soon! "The house was really nice, very comfortable, and has an amazing view. A-1 was extremely helpful and has an app for your phone that they can send you updates and you can check weather reports and has things you can do for bad weather. All in all we will definitely be using A-1 beach rentals again!" Manager Response: Really glad you enjoyed your time at Moonbreaker! Please visit again soon! "Moonbreaker is a delight to stay in, cozy, warm and right on the beach, no need to go anywhere but look out the window with a glass of wine in hand and good friends." Manager Response: So glad you enjoyed your time at the beach! Please come again soon! "Very pleasant stay. Great location. Quiet in October. Weather was great. House had everything we needed. Lots of deck time watching sunsets and listening to the waves. Hope to return." Manager Response: Really glad that you enjoyed Moonbreaker! Hope you visit again soon! "Great house, great location and great weather ( but that's not always going to be). The view is spectacular, no matter what the weather might be. Will be back! " Manager Response: Glad that you enjoyed Moonbreaker! Come again soon!
" This was our fourth stay at Moonbreaker, nice location, sure would be nice to see some updating inside but very comfortable and clean. Upstairs bedroom exterior door will not lock still, same as last year. " "Had a wonderful time! " Manager Response: Thanks for staying! Please come again soon! "moonbreaker was lovely. it's location was perfect and the house itself was equal parts cozy and immaculate. we loved the fire pit, the bath tub, the center island in the kitchen, the sheets, the towels and the laundry. we will definitely be back." Manager Response: So glad that you enjoyed Moonbreaker! Hope to see you again soon! "Absolutely loved the seaside cottage! 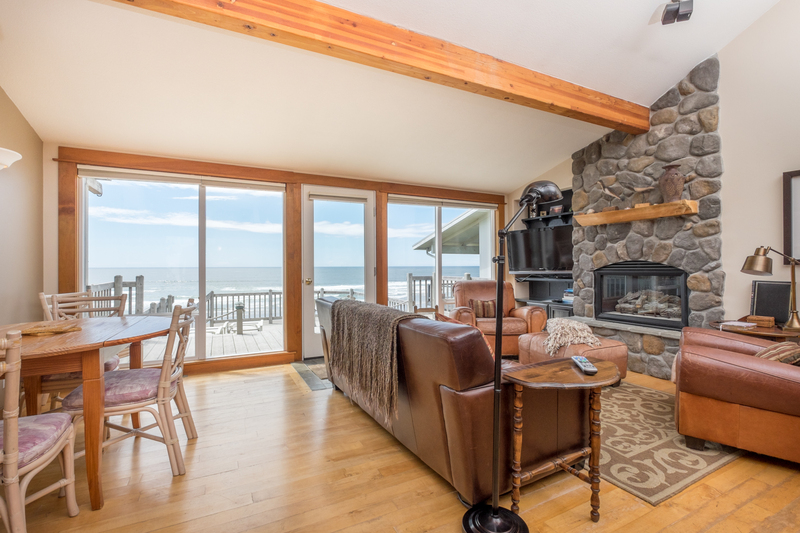 Excellent location just steps to the beach with unobstructed ocean views from every room. Very clean and comfortable. Would highly recommend this cottage." "Had a great stay at Moonbreaker over the holidays. The house is fantastic, comfortable, warm, and had everything we needed to prepare meals and relax. The views are fantastic from both inside and outside the house. And it was incredible having our own set of stairs right down to the beach. Wifi was good, SmartTV with Netflix built in. Really quick drive up the road to Safeway yet nice being away from all the traffic on the main drag in Lincoln City. Really no complaints at all, will definitely return!" Manager Response: Really glad that you enjoyed your time at Moonbreaker! Hope to see again soon! "We have made it an annual getaway to Lincoln City for most of our 36 years of marriage. We have stayed at many A1 Beach houses and found this to be on the top of our list. Loved the upstairs master suite. 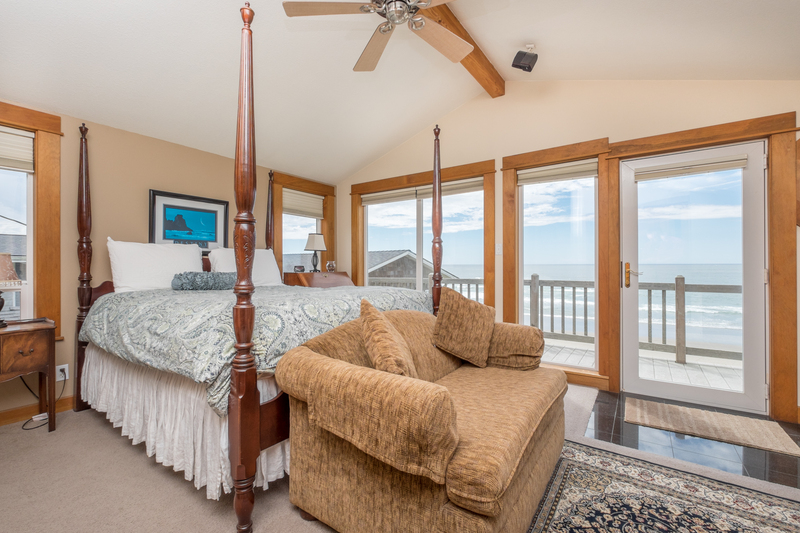 Falling asleep to the sound of the waves and waking up to a fantastic view is just a small taste of what this house has to offer. As always, Karen was great to work with. " Manager Response: So glad that you enjoyed your stay at Moonbreaker! Hope to see you again soon! "The home is beautiful, well appointed, and in a perfect location! It looks and feels exactly as it appears in the listing- what isnt captured in th description is the wonderful sound of the ocean and the perfect location for walks on the beach, drives down or up the coast, short drives to great hikes- the experience at this home was wonderful- great staff at A1Beach Rentals, beautiful and perfectly clean home in a perfect location! " Manager Response: Really happy that you enjoyed your stay at Moonbreaker! Hope to see you again in the future! "This was our 6th stay at Moonbreaker and we had a wonderful, refreshing and relaxing time at this home. The view was fabulous and the walks on the beach were awesome. " "We have stayed at the moon breaker twice now and have loved it both times. 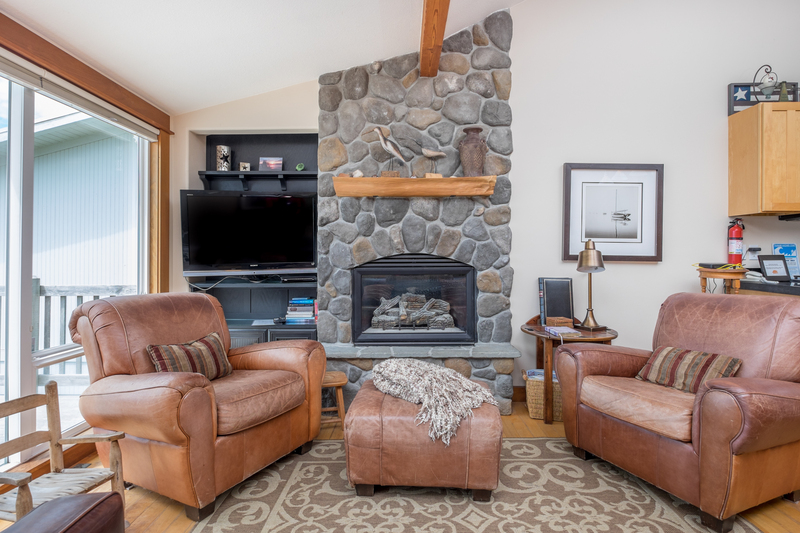 We love the gas fireplace and awesome view." "Our family has been coming to this house for 12 years- our boys have grown up here. It couldn't be more wonderful and never disappoints. It's always hard to leave! Not too big, not too small. The sheltered deck is the best! Clean, comfortable, and quiet. Only down side is the tiny downstairs shower- tough for my 3 over 6' men to negotiate- but still worth it!! " "My wife and kids loved this house it was very cozy and the deck was perfect, easy beach access,fireplace, this home has it all, excellent vacation home I would recommend this home for 2 couples or small family." "Wonderful experience. Home was perfect size and view was absolutely breath taking. We will definitely be back. " "Very nice house, second floor with view is exceptional." "Perfect getaway! Relaxing, close to local amenities. Great layout, loved the deck!" "We had a wonderful time at Moonbreaker--very comfortable, great to have immediate access to the beach. The deck is in great condition and if we weren't on the beach we were on the deck! Perfect. " Manager Response: Thanks for staying with us! "The home was beautiful perfect location we will be back..."
"The Moonbreaker was just right for our stay. In fact, we've already booked our next week stay for next March. Conveniently located, clean and has all the comforts of home. We loved our stay." "Great view of the beach and ocean. Comfortable home with all appliances available. We especially enjoyed the fireplace and the floodlight on the ocean at night. Our only problem was the door to the deck would not lock. I called the motel to let them know but no-one ever came to fix it so we just propped a chair under the nob for security and left a note for the cleaning crew." Manager Response: Thanks for staying; please come again! "Our winter vacation at Moonbreaker was great! We noticed that the coffee pot in the kitchen was missing, we called and they had a brand new pot delivered within hours! Also had to call when a pilot light went out in a fireplace. Again, an immediate response! Wonderful staff! We had a terrific time and extended our stay a couple of days! Great location,great view, highly recommend!" "Second time we've stayed and both times we loved it. Got our return reserved for October and looking forward to it already. " Manager Response: Thanks for coming! Please visit again! "Everything was nice in the home. The TV/VCR was not working but I just called Tom and he came in less than 15 minutes figured out the problem and went and bought the part and all was fixed in less than 1 hour. Tom was great and he is a real asset for our stay. The only problem with the home is that there is no oven. " 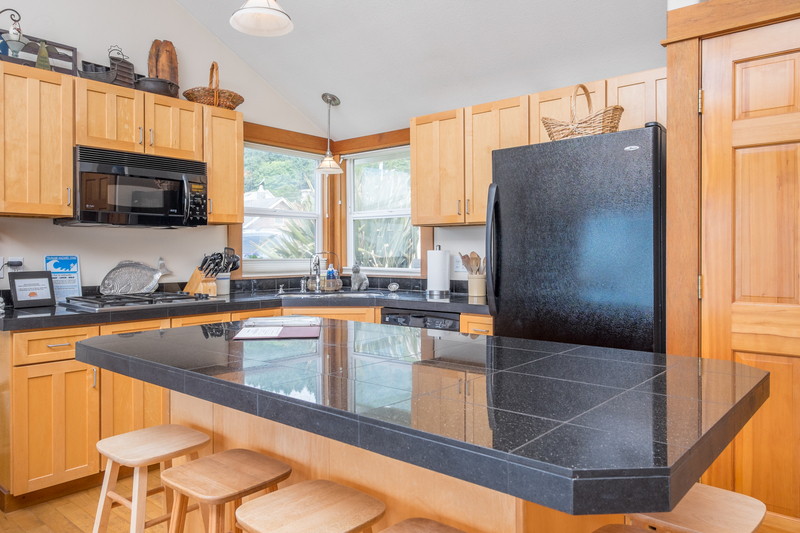 "Rental is on the north side of Lincoln Beach it is only a mile from significant shopping, restaurants and the Casino, yet in an area where you mostly see forested hills and the ocean. Very nice beach, trail at end of road to an overlook. Rental is clean and fully stocked. Master bedroom is on the 2nd floor." "The house was fantastic for four people! Sitting on the deck watching the sunset and enjoying the great views from both the living room and the master bedroom was the best part. We will definitely look to rent this house again in the future!" Manager Response: Thanks for coming! Please visit again soon! "You never know what to expect from Mother Nature but it doesn't matter when you have such a great spot to view it all. Our week was filled with wondrous opportunity. We had 3 days of glorious sunshine, a couple of days of clouds, a couple of days of the "big" storm. We were able to relax, walk on the beach, enjoy the views, and sleep to the sounds of waves. Third time we've stayed at Moonbreaker. It feels like home now. Thanks for sharing!" Manager Response: So glad you enjoyed your stay! Please come again soon! "The view was awesome and the weather was perfect for the memorial day weekend to just relax and watch the seals n whales from the deck." Manager Response: Glad you enjoyed your stay! Stay again soon! "Not only is the house spectacularly perfect, but the weather cooperated as well - our weekend was even more beautiful than the one in the photo! Love this place." "We lived our stay here. Beds were both comfortable. The kitchen is very well equipped. The deck is fabulous. Watch the step coming in. The lighting is beautiful but low and it was hard to see in the kitchen. The furniture is also comfortable and windows are fabulous and exceptionally clean. Can't wait to go back!" Manager Response: Thanks a lot! Come back soon! "Perfect location for my husband and I since our daughter and her husband and 3 of our grandchildren were staying in a beach house just a short walk up the road. Very convenient access and walk to the beach as well as a short drive back up the road to any type of store, restaurant, gas station we needed. Also, many fun attractions available in very drivable distances from the house. The house was very well stocked with most everything in the way of nonperishable supplies that we needed-we were pleasantly surprised. We brought a lot of items along that we would not have needed to bring, but now know what is supplied at the house for future visits there. Everything was great! the upstairs balcony door lock works with some difficulty; the windows in the downstairs bedroom made us a bit uneasy in the way they opened and the lack of security when they were open; a couple of the white plastic lawn chairs were broken so should be discarded because they are dangerous if someone should sit on them. We loved the house and would gladly rent it again in the future. Thank you!" 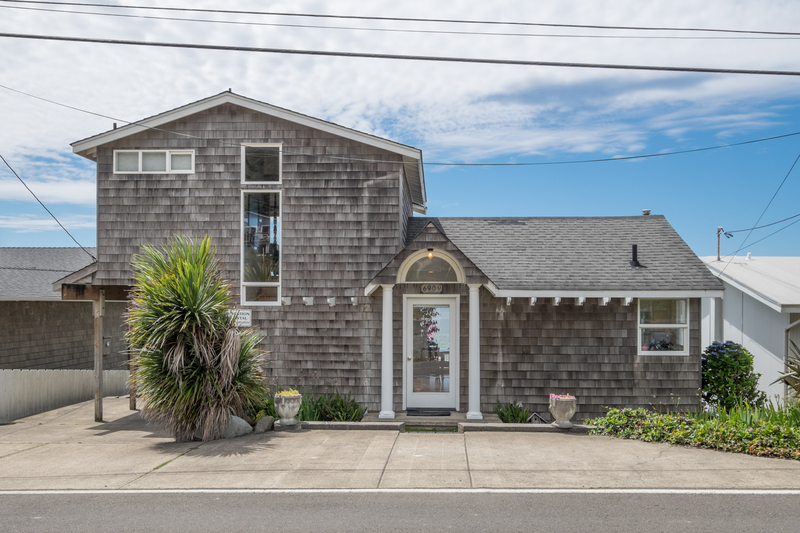 "This is the best house yet we have ever rented in Lincoln City. We've been renting houses for quite a few years, and Moonbreaker tops them all. The house is so cute and cozy, well maintained and super clean. The deck here is amazing. The house is set back just enough between the neighbors so that you don't get a lot of the wind. It may be fairly windy down on the beach, but on the deck it can be really pleasant. The view is wonderful. Inside, we found the kitchen to be well stocked, everything we needed was there. Someone has a great talent when it comes to the decor. The house is super cute and so inviting. Makes you feel like you could stay there forever. The upstairs bedroom was really neat. 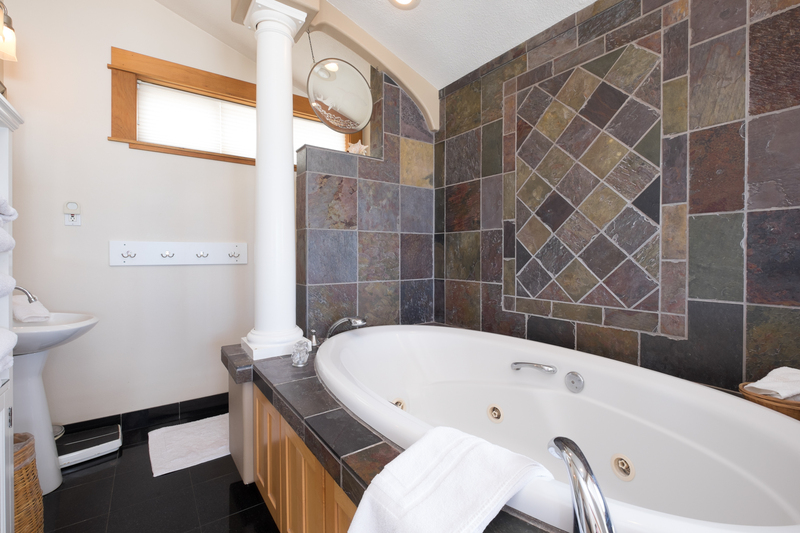 Your own deck, fireplace, wet bar, coffee maker, small fridge, large jetted tub and fabulous view. Overall, I have found that A-1 Beach Rentals have the most amazing properties. I've never had an issues with anything when I've rented from them." Manager Response: Thanks you very much! We appreciate it and hope to see you again soon! "We thoroughly enjoyed your home! Great location with miles of beach. Of all the homes we have rented, this one definitely had the largest deck and an amazing view. " Manager Response: Glad you enjoyed the property! Hope to see you again soon! 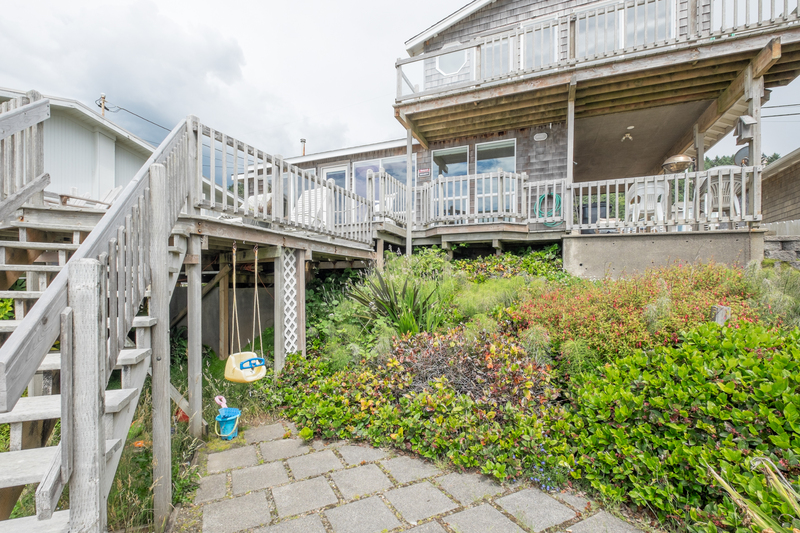 "Moonbreaker is a wonderful beach house, with great ocean views!" Manager Response: Thanks for visiting! Come back soon! "Wonderful home....great bed upstairs...we enjoyed our second visit there just as much as we did our first time! Will look forward to coming back again!!" Manager Response: Thanks so much for staying! Please come again soon! Manager Response: Thanks for visiting! Please come again soon! "We were very pleased with the Moonbreaker beach house. The open plan and views are outstanding. We will be making a return trip! " 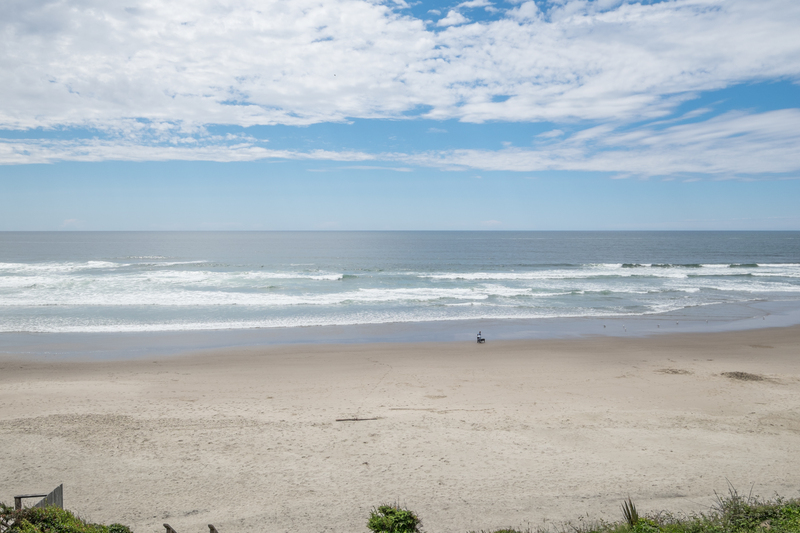 "We had no idea Oregon's coast offers white sandy beaches! Moonbreaker was as perfect as could be - just the right size for my husband, daughter, new son in law and myself. The cottage is cozy, well equipped, quiet and the views are spectacular. One bedroom is on the main level and the other upstairs providing privacy for both couples. We enjoyed the deck and hammock overlooking the ocean. Hearing the ocean at night was so soothing! Management was very quick to respond to our online inquiries, the home was very clean, bedding comfortable. The location was superb with easy access to more activities than one can fit in a weekend. We had the most amazing seafood at local restaurants! We all would go back in a heartbeat. This one's a 10+++ !!!" Manager Response: Thanks so much for your kind review! We hope to see you again soon!